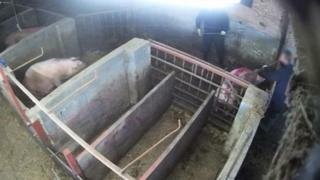 Three farm workers who "relentlessly" abused pigs by kicking them in the face and jabbing them with pitchforks have been given suspended jail terms. An animal welfare charity used a hidden camera to film the abuse at Fir Tree Farm in Goxhill, North Lincolnshire. Gavin Hardy, 39, of South Killingholme, Troy Wagstaff, 30, from Grimsby, and Artirs Grogprkevs, 32, from Goole, all admitted causing unnecessary suffering. They received suspended eight-week jail terms at Grimsby Magistrates' Court. District Judge Daniel Curtis told the trio the footage was "sickening". The footage from charity Animal Equality UK was passed on to the police and the RSPCA. The owners of the farm sacked the men after an investigation, saying the actions were "abhorrent behaviour that does not represent our business". Hardy, of Greengate Lane, South Killingholme, had shown "no remorse", his legal team said. His lawyers claimed he was ''desensitised'' to the rearing and slaughtering of pigs after working at the farm for 20 years. Troy Wagstaff, of Chantry Lane, Grimsby, was the designated animal welfare manager at the site and was responsible for training other staff on good practise. He was described by his lawyers as "weak and foolish" but "full of remorse". The court heard Artis Grogprekevs, of Oak Road, Goole, accepted his behaviour was unacceptable. Judge Curtis said: "The footage is sickening to watch. I don't draw any distinction between acts of violence against human beings and animals. "In some ways it is worse that they are against animals as they are defenceless."